English translated by Ekaterina! Many Many Thank!!! The only one in history two-time Olympic champion in RG, 17-time world champion – Evgenia Kanaeva is not excluding a possibility of her return to the sport. Today she’s been talking about that with ITAR-TASS reporter during the first stage of Grand-Prix Moscow. “I am still living and breathing gymnastics – attending the championships, following the events; has attended practice in Novogorsk, – said Kanaeva. – For the time being, I have taken some time off, and my future in the sport will depend on my health – soon I am leaving abroad for treatment. ITAR-TASS correspondent wondered if Evgenia Kanaeva was planning to become a mother in the near future. 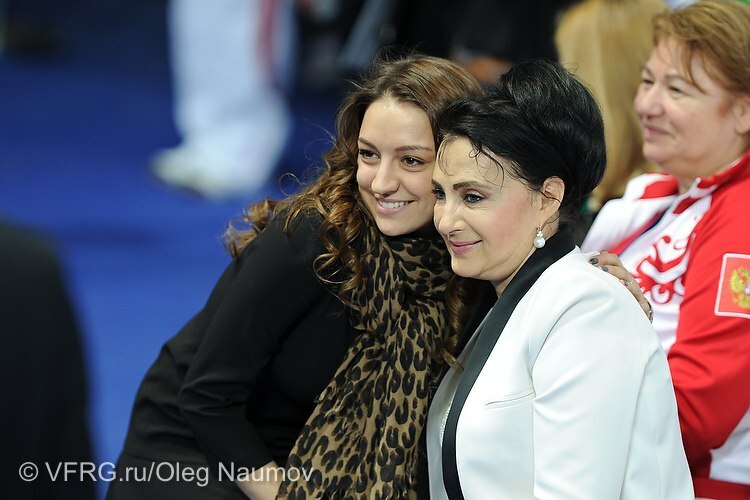 Evgenia Kanaeva answered with a smile: “I cannot plan that, but every woman, girl, dreams about that, and so do I. But so far it has not happened to me”. Two-time Olympic champion at this point cannot see herself as a trainer. “So far I have not been thinking of doing that, – said the gymnast. – I can come to the team practice and give some tips or help with something, but not more than that. The members of our team are children: they need support and praise. Now they have a chance to prove themselves. At this point, I have other goals”. As a RRGF vice-president, Evgenia Kanaeva attended championships of Russia in Kazan in the beginning of the year. “We were selecting girls for the team, – said Kanaeva. – So far I have been fulfilling that sort of duties in this capacity. My thoughts about my appointment? You see, Irina Aleksandrovna Viner-Usmanova would never leave any of her athletes in any trouble. You can call her with a problem at any moment, and she’ll help. She is an honorable person. I will also be doing my best to do everything I can for our sport”, – promised the Olympic champion. She also emphasized that she was not excluding a possibility of her returning to the sport: “Everything will depend on the state of my health – for now I have taken time off”. There are many stars but sun is nearest. There are many flowers but one is favorite. Zhenya belongs to Irina Viner and later she becomes Irina Viner. Zhenya has had the very first trainers, very good trainers in her family like mother, grandmother and I think that her father and brother have been very helpful too. Tradition is very important so now it’s time for Zhenya to have her own sport family. I am a man who could be the son of Irina Viner and the father of the best star flower. I must come back to Poland, to Joanna Mitrosz and her followers, maybe daughters, Polish champions, maybe World champions. Thanks to zhenyakanaevagymnasium.com for fascinate adventure, see you in Rio. @StretchyLily, thank you very much for your sharing about the experience of coaching. very nice to read. and I wish you success in gymnastics in the future. I understand her preference for not coaching, only giving tips and support. I coached gymnastics for some time; it takes a lot of time and energy, can sometimes be monotonous, and it’s a really heavy committment. I could not continue coaching other people because I realised I had other priorities and goals for my life, and I was not finished doing gymnastics myself. Good message! All for one, one for all! World for Zhenya, Zhenya for World! I am an amateur. Professionals for amateur, amateur for professionals! Zhenya is a woman and all women.